While greyhounds make great pets, they're also therapy dogs and certified assistance dogs. One greyhound, Rosie, helps those living with disabilities to enjoy exercise despite the hard work, while her owner helps them keep fit. Belinda Duddy, a personal trainer who lives in Tarrawanna on the NSW south coast, first fostered then adopted greyhound Rosie from Greyhound Rescue in 2014. Rosie, now aged 14, has been a big hit with some of personal trainer Belinda’s clients. Martin Reed is a local who lives with schizophrenia. Greyhound Rosie has lightened his load, especially when it comes to his previously strong fear of dogs. 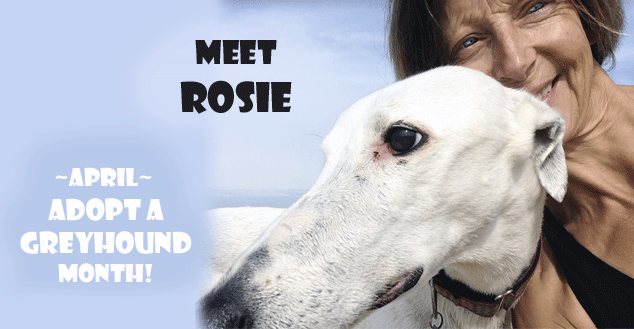 "Rosie has helped me be less frightened of dogs because she is so gentle. She's a good helper in my fitness training too," said Martin. Janet Flann, Greyhound Rescue founder, said during April is 'Adopt-a-Greyhound Month', the Sydney charity wants to celebrate these dogs and find them more new homes. Co-founder Peter Flann said there are many ways the public can help unwanted hounds. "If you can’t adopt or foster, you can sponsor, become a volunteer, or provide a donation - just go to our website. We find once people have a greyhound, that's it. They're so beautiful, you're hooked. Some greyhounds have even been re-homed in aged care places and bring residents much joy, while others have been trained as therapy dogs," he said. Peter said those interested in adopting should be aware that muzzling your greyhound in NSW is not needed if you obtain a Greenhound1 collar. Muzzle rules vary across Australia - but both the RSPCA and the Australian Veterinary Association recommend against muzzles for pet greyhounds.